Properties in Imster Gondola average 4.6 out of 5 stars. A house in a superb position in the mountains above the town of Prutz. Property 55: A house in a superb position in the mountains above the town of Prutz. Allow yourself to be the starry sky and enjoy the night! Property 70: Allow yourself to be the starry sky and enjoy the night! Atmospheric apartment block with sauna and fitnessarea. Property 81: Atmospheric apartment block with sauna and fitnessarea. The host, Melanie, was the nicest host I have experienced in using temporary rentals. She was flexible in meeting us to let us in to the downstairs apartment of her home, even though we were unsure of our arrival time. She greeted us with a couple of gifts and the property itself is tucked into a beautiful mountain. The mountain views at any time of day were breathtaking. Inside the property was plenty of room for the 3 of us and a wood stove that was already lit for our arrival. 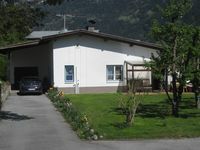 This property is approximately 20 minutes from St. Anton ski area. There is a bus station at the base of the hill or a train station that is a 20 minute walk to go back and forth to the ski area. I would absolutely rent here again and recommend it to anyone that is going to Austria for a ski weekend.